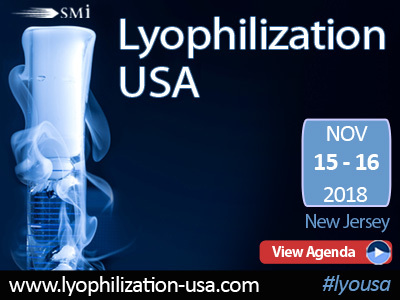 SMi Group reports: Leaders in the lyophilization industry to share their expertise and knowledge at SMi’s 4th annual conference – Lyophilization USA, November 15 – 16, New Jersey. Recently, event organisers caught up with some of them to discuss key challenges within the lyophilization field. Fabrice Schlegel: Lack of resources invested by biotech companies in the development of more innovative processes for lyophilization. Mohamed AbouGhaly: The greatest challenge is in turning process from a trial and error approach to a more systematic and predictable approach. Timothy McCoy: Scalability is always a challenge; especially with the freezing step. There are currently techniques out there to better control the ice nucleation process, and to allow better control of primary and secondary drying. Fabrice Schlegel: The move from in-vivo to in-silico experiments to reduce the experimental burden related to lyophilization process development. Mohamed AbouGhaly: The continuous advances in wireless temperature probes that can monitor products in process. Timothy McCoy: I am not sure if there have been many new technological innovations over the last year, that are completely new to the field. However, many technologies have been improved and expanded. I am interested in the mini lyophilizer systems such as microFD and LyoCapsule; PAT technologies such as LyoDEA.